At the Flash on The Beach's keynote this morning John kicked off the conference and made some cool announcements. 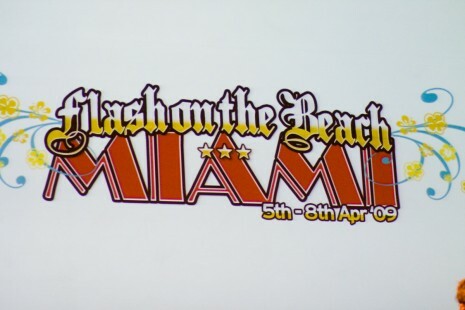 One for all is the next location for Flash On the Beach (aka FOTB) 2009 : Miami. Tickets will go on sale in November so you have to wait. John is like the Flash Player: everywhere, anywhere (other than ! His conference is getting bigger and better year by year ! Great job man. I've just finished my presentation about Developing Mash Ups AIR applications and I can now enjoy the conference ! FOTB Day 1 is goint to end and if you can't wait you can get a recap from FlashMagazine.com. Yesterday I've blogged on using the Bookmarks View in Flex Builder. I've found another cool feature you can use with Bookmarks to associate a custom keyboard shortcut to create a bookmark. I'm setting up the demo assets I'll show in my speech at the FOTB conference in Brighton. In a presentation where the speaker has to show a lot of code buried in several different classes it's extremely useful to have the ability to quickly access to the right line of code. 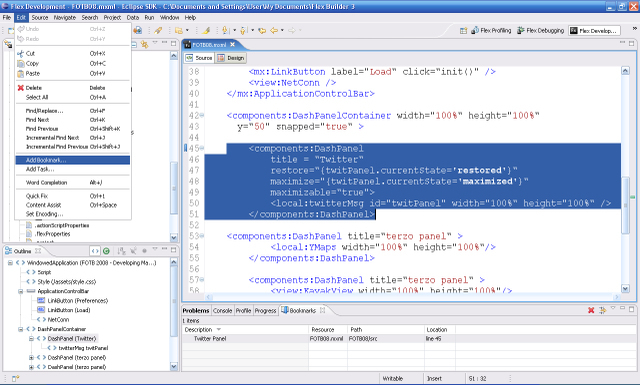 This is where the Bookmarks View (panels in Eclipse IDE are called Views) of Eclipse and Flex Builder as well comes in handy. 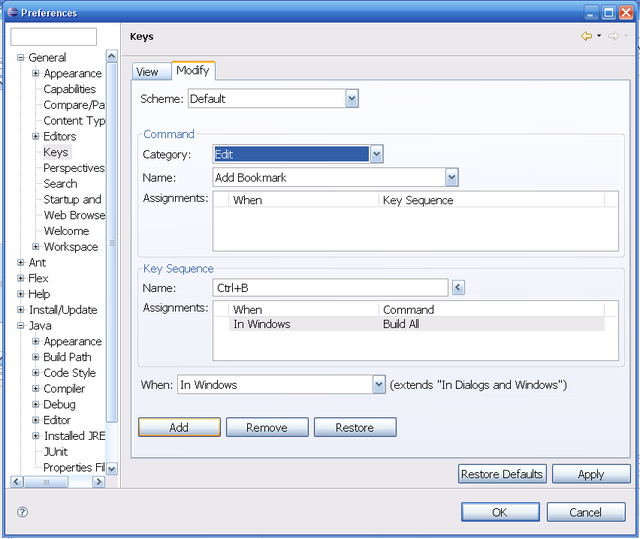 The Bookmarks View is not opened by default in the Flex Builder Flex Development perspective. So you have to open it from the menu Windows > Other > Bookmarks. Once opened, you'll be able to create a boomark choosing the file or the code fragment you want to point to. Then select from the menu Edit > Add Bookmark and a reference to the selected object is inserted into the Bookmarks View. Now that you've bookmarked your file or code, a click on the bookmark is enough to quickly open and point to it. I'm so excited that the upcoming O'Reilly AIR Cookbook for which I'm one of the author has got a front cover ! 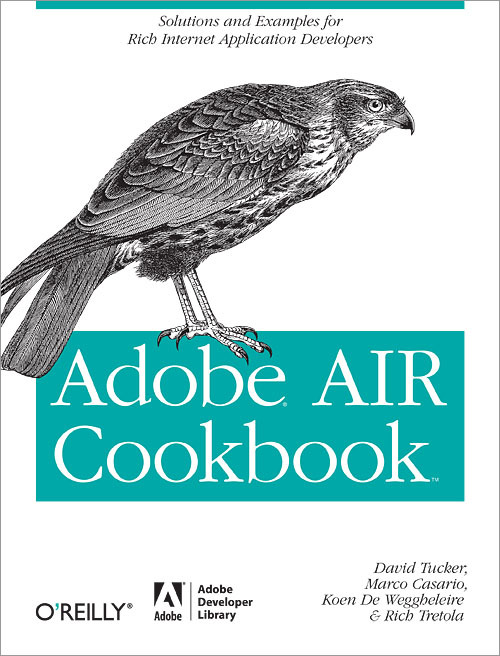 Thoroughly vetted by Adobe's AIR development team, Adobe AIR Cookbook addresses fundamentals, best practices, and topics that experienced web developers and application designers have inquired about most. This collection also includes solutions for using this runtime environment to build truly innovative applications. And much more. Adobe AIR Cookbook not only includes dozens of recipes from rising stars in the AIR development community -- David Tucker, Rich Tretola, Marco Casario, and Koen De Weggheleire -- it also features the best solutions posted by visitors to the Adobe AIR Cookbook community website hosted by Adobe and O'Reilly. For a this application is crucial to check and monitor the the connection against TCP/IP socket endpoints. The service monitor framework is contained within the external resides in the file servicemonitor.swc. file. In order to be used, must be imported into the the AIR project. While Flex Builder includes this automatically, if you're using the Adobe Flash IDE to create the AIR application, you need to import the ServiceMonitorShim.swc file into the Library of the Flash project in your AIR application package. Adobe Systems Incorporatedtoday reported that there have been more than 25 million installations of applications deployed on Adobe® AIR™ in the first six months since its release. Numerous Fortune 500 companies, in addition to start-ups across a variety of industries, have deployed hundreds of AIR applications to engage with customers, partners, and employees in new and compelling ways. Twhirl's CEO just claimed that they have over 500,000 installs of their AIR client. This is an amazing result considering the nature of AIR, a desktop runtime ! I spoke at Web 2.0 Europe last year and it was great. The 2008 edition of Web 2.0 Expo will happen in Berlin on 21-23 October. Unfortunately I won't be there this year due to my speech at The ActionScript Conference in Singapore. But our Managing Director in Comtaste will be there. Web 2.0 expo is not only a cool conference where you'll learn a lot of technical and marketing stuff concerning Web 2.0, but it's a great opportunity to make networking. Everything is set up. My flight, my hotel and my partecipation at the first edition of The ActionScript Conference 2008 in Singapore. Unfortunately it's too late to register to the event. In fact the conference is sold out ! The Actionscript Conference (TAC) is a community conference with the focus on Flash Platform. Attendants will see themselves immersed in a day of learning, knowledge exchange, and networking. TAC aims to bring topics on Actionscript 3.0, Flash development, Enterprise Flex, AIR, Integrating of Flash and other Platforms, and building Rich Internet Application to its audience. Using the NativeMenu and NativeMenuItem classes supported by Adobe AIR APIs is pretty easy to create native menu. The code above creates two menu items, File and Open Recent Files, within a native menu using the NativeMenu and NativeMenuItem classes. I've written two different lines depending on the operating system the application will be run. This is one of the few cases which developers have to handle with a condition tht verifies the operating system is run. But one cool thing very useful in a desktop application that works with local files is a Open Recent Files menu item features. This menu item acts like a history list of opened or created file. The data property is set to the file object that contains the reference to a PDF file, Flash.pdf, contained inside the stadard directory: documentsDirectory.